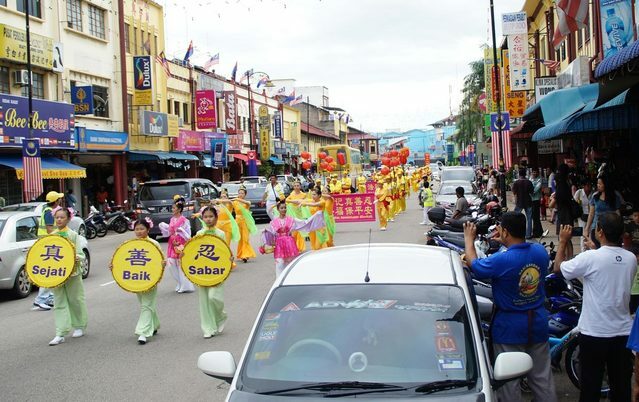 Following parades which took place on the fourth and fifth day of the lunar New Year in two cities in Johor, Falun Gong practitioners in Malaysia and Singapore visited two other cities in northern Johor where many Chinese people live, to bring local people New Year's greetings and blessings. Their performances attracted the attention of numerous citizens and local media in Tangkak. Falun Dafa practitioners first came to Bukit Gambir. The parade procession featured the Divine Land Marching Band, Lantern Team, Dragon Dance Team, Celestial Maidens Team, and Waist Drum Team. The parade set off at 10:00 am, with many local people being drawn to the street by the joyful and lively music. They were happy to see such a spectacular procession, which was characterised with the flavour of traditional Chinese culture. Spectators were full of praise and expressed their hope that the practitioners would come again next year. Mr. Chen said, “I felt so good after watching the parade, it adds to our New Year's festival atmosphere.” “I hope you will carry forward our Chinese culture. A great effort!” he said. Indian citizen Adnan was also impressed with the good cooperation demonstrated by the practitioners. He said that he'd also received a taste of Chinese culture. Practitioners held another parade that same afternoon in Tangkak. The parade began at around 5:00 pm, with the grand parade procession drawing the attention of a crowd of people standing along the main roads. They had high praise for the parade and hoped that the practitioners would come again next year. Marini, a native of India, who works in an engineering-related industry, said that she felt the entire parade was very peaceful. Another Indian citizen, Mazila, said that the Falun Dafa parade was indeed different, and that the joyous atmosphere they brought to the city was unique. Mr. Zhong had heard of Falun Dafa before, and this was the first time he had personally got in touch with Falun Dafa. He thanked practitioners for telling him about Falun Dafa. 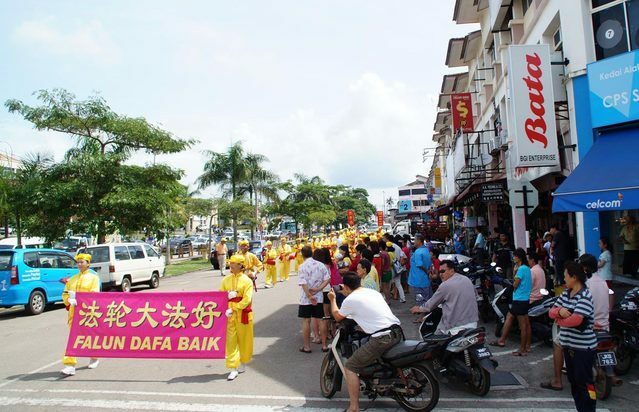 The Falun Dafa practitioners' New Year parade also attracted the attention of local media in Tangkak. One of the mainstream Chinese media in Malaysia, China Press, published a report on the parade with photos in Section Johor on February 18th. The eye-catching report was published in full colour.